I am hoping someone can help, I am trying to locate Cae Warren on the 1871 census Holyhead, I have found it on the 1861 and 1881, 1891, 1901 I have tried looking for the family that lived there in 1871 but I am wondering if the 1871 is missing for that area. I have searched areas on the ancestry site, but I am unable to locate any of the family in 1871 I know they were there from 1861 - 1891, and a different family are at the address in 1901. The names I am looking for in 1871 are William Jones born abt 1838 Llaniestyn Holyhead, and his wife Ann(e) born 1841 Holyhead. I am researching this for a friend, he has William and Anne's marriage cert from 1860, William's father is Lewis Jones, farmer, Anne Was Anne Thomas. If anyone can help I would be most gratefu. It might be Bodwarren farm which is situated near Holyhead mountain I think it was part of the Stanley Estate its the only farm that I know of around holyhead it might of changed its name the farm is still a working farm today could that be why you cant find it on the census? 28 September 1868, Cau Waren (sic), Holyhead - Ellen Jones, 72 years, wife of Lewis Jones, Farmer - Cause of death "Decay of Nature, not certified". Not related to the 1871 census, but may be of interest? Wow, thank you so much for the information, I think it is the same family, I have done further research, and found a lot more about the family, I also found a newspaper article (1863) about the family having a servant steal goods from them, the servant was caught by Menai Bridge trying to get away on a boat with the goods. The name of the people she stole from was Lewis Jones and his wife Ellen of Cae Warren. I will pass the death information on to the person I was doing the research for. i will try and find the article again and hopefully post it on here. No restrictions apart from uncatalogued material, which includes David Hughes Charity records. 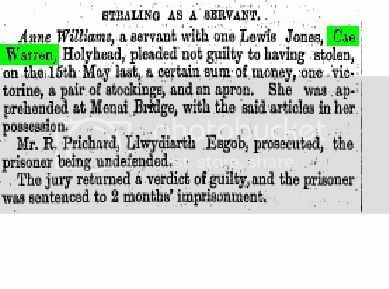 [from Scope and Content] Of Ellin and William Jones of Cae Warren, parish Holyhead, Owen Jones of Four Mile Bridge, shop-keeper and Owen Hughes, police officer in the case v. Anne Williams accused of stealing a sovereign, a victoreen, a pair of stockings and an apron, the property of Lewis Jones. Deponent E.J. states that A.W. was in her service but left unexpectedly, whereon the sovereign and other items were missed. Deponent O.H. says he pursued the accused to Menai Bridge and found her about to board a steamer for Liverpool. The missing clothes were found on her person and in her box. [from Scope and Content] Of Lewis Jones, farmer and William Jones both of Cae Warren, Owen Jones of Four Mile Bridge and Owen Hughes, police officer, parish Holyhead to appear at the next Q.S. to give evidence in the case v. Ann Williams accused of stealing one sovereign, one victoreen, a pair of stockings and an apron, the property of L.J. [from Scope and Content] Of Lewis Jones of Cae Warren, parish Holyhead, farmer, for his own appearance at the next Q.S. to prefer a bill of indictment v. Ann Williams. May I ask who you have been researching about the Jones family on behalf of?? I did this research some time ago for someone on another forum, I could try and find them again and perhaps put you in contact with the person. Ted is my Uncle! He doesn't have a son, but his brother Melvin who is also my uncle is researching our family tree. Thanks, I got a bit confused as to Ted's brother, I thought it was his son, but yes it is the same family.